Got a Minute for MS? Multiple sclerosis (MS) may not be the most prevalent of the diagnoses that we treat, and its place as the “most common disabling neurological disease of young adults”1 is dubious (migraine is far more common and chronic daily headache affects 3 to 5% of the US population), yet the asymptotic pace of MS research has forced all neurologists to pay close attention to the world of MS. 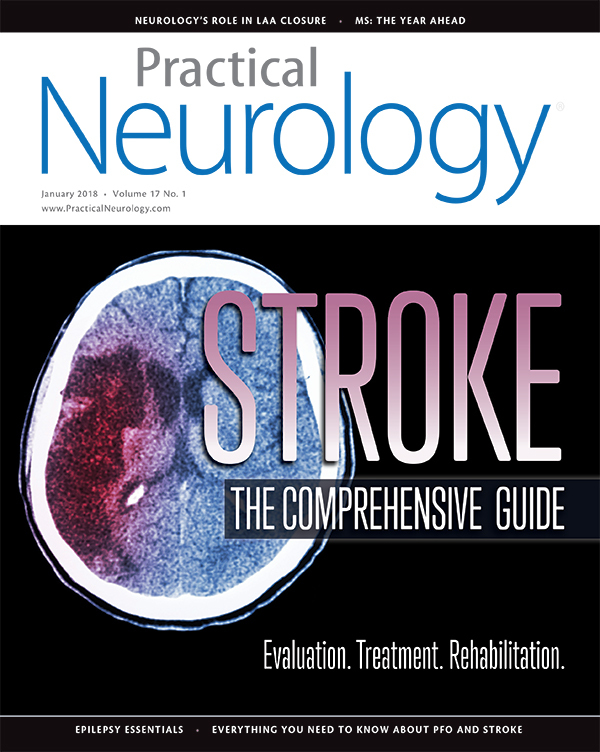 Starting with this issue of Practical Neurology, we will bring to you digestible (and palatable) summaries of the most important moments in MS throughout the year. We concluded 2017 with 13 separate branded DMTs, one branded generic, and two unbranded generic DMTs for the proactive treatment of MS, and it is important for us to recognize how far we have come in what was an untreatable disease (with no FDA-approved products) as recently as 1992. Although neurologists have done an excellent job in conducting rigorous randomized controlled trials, we have (until recently) faltered in the US in producing real-world evidence through a national, prospective MS registry. On October 20, 2017, the National Multiple Sclerosis Society and Corrona LLC announced their collaboration in the launch of the Corrona MS Registry,7 which has already recruited 100 patients in three months. Corrona’s collaboration with the National MS Society builds upon its 17 years of experience in conducting the largest registry of patients with rheumatoid arthritis (over 45,000 patients have entered the registry) and the successful ongoing collaboration for its psoriasis registry with dermatologists and the National Psoriasis Foundation. Throughout 2018, we look forward to your feedback as MS Minute highlights important research, advocacy, and events in the world of MS.
1. Rolak LA. Multiple sclerosis: it’s not the disease you thought it was. Clinical Medicine & Research. 2003;1:57-60. 2. Thompson AJ, Banwell BL, Barkhof F, et al. Diagnosis of multiple sclerosis: 2017 revisions of the McDonald criteria Lancet Neurol. Available online 21 December 2017. 3. Montalban X, Hauser SL, Kappos L, et al. Ocrelizumab versus placebo in primary progressive multiple sclerosis. N Engl J Med. 2017;376(3):209-20. 4. Polman CH, Reingold SC, Edan G, et al. Diagnostic criteria for multiple sclerosis: 2005 revisions to the “McDonald Criteria.”Ann Neurol. 2005; 58: 840-6. 5. Dobson R, Ramagopalan S, Davis A, et al. Cerebrospinal fluid oligoclonal bands in multiple sclerosis and clinically isolated syndromes: a meta-analysis of prevalence, prognosis and effect of latitude. J Neurol Neurosurg Psychiatry. 2013;84:909-914. 6. https://msworld.org/conference-center/?content=the-mcdonald-criteria-and-spinal-fluid. Accessed January 3, 2018. 7. Corrona Partners with National MS Society on Registry to Assess Safety and Efficacy of Therapies. http://practicalneurology.com/news/?id=49459¢er=36. Accessed January 3, 2018.